Tattoo Blog » Jeff Johnson’s Tellin’ Stories. Tattoo Blog » News » Jeff Johnson’s Tellin’ Stories. It’s often said that writing and art are two sides of the same coin, and there are more stories in a tattoo parlor than books in Barnes and Nobles. Well, Jeff Johnson, co-owner of Portland Oregon’s oldest tattoo studio The Sea Tramp Tattoo Co., is out to prove just that. 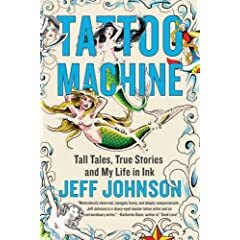 The release of his debut book, “Tattoo Machine: Tall Tales, True Stories, and My Life in Ink.”, has come out to rave reviews, and it’s not hard to see why. There are stories about the scams people use to try to get free tattoos, like the “Two-Tattoo Rub.” Tales about the pranks the guys in the shop pull on each other like sabotaging the artist’s favorite tattoo machine, or the time he thought he might have tattooed a serial killer. That one can give you a good case of the heebie-jeebies. The book itself reads like a autobiography sprinkled equally with all the stories and events that come from running a tattoo studio. You artists out there know exactly what I’m talking about there. If you have a studio one thing you can say for certain, it’s as far from boring as Hilary Clinton is from Lindsay Lowhan. After 18 years in the business, Jeff certainly has seen more than his share, and knows how to tell them too. Jeff is himself a master tattoo artist, as well as a talented writer and story teller. Totally in love with not only the art of tattooing, but the unique atmosphere of a trade that most people are curious about, but few get to enter into. This, and much more comes out in his book, and it’s well worth the price, ($16.50 at Amazon). Here is a Tattoo book that deserves to be added to any artist, or serious collector’s book shelf. If you love tattoos and good stories you’ll love this.